Rebels went on the offensive in and around Damascus while 18 people were killed in shelling, blasts and clashes across Syria, including coastal Latakia, a watchdog said on Wednesday. “Violent clashes broke out in Harasta between regime troops and rebel forces,” the Syrian Observatory for Human Rights said, referring to a northern suburb of Damascus. 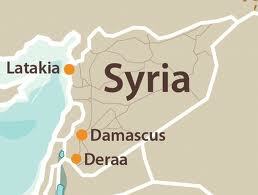 Rebels also attacked checkpoints near Douma, Irbin and Zamalka, all in Damascus province, it said. A student was killed when regime forces pounded Hreitan in the northern province of Aleppo, the Observatory said. Elsewhere in the province, two civilians were killed by gunfire near the village of Sheikh Issa. And at Aleppo University, where massive protests broke out in May, fresh demonstrations were halted by security forces, who arrested a number of students, the watchdog said. In the southern province of Daraa, violent clashes between troops and armed rebel groups in the area of Lajat killed three soldiers and wounded eight others, while security forces launched raids and arrests in the village of Nafaa. Three troops were killed, including a captain, in an explosion targeting their vehicle near Srakeb village, in the northwestern province of Idlib. In the same region, four officers were injured in an attack by rebel fighters in the town of Maaret al-Numan, and the village of Marayin came under attack by regime forces, the Observatory said. In Latakia province, regime forces rained shells down on the town of Shirqaq, killing a family of three, and on the town of Al-Heffa, where another three people died. Wednesday’s shelling followed clashes and raids the previous day in Latakia, including in Al-Heffa, during which 33 people were killed, among them 22 troops, nine rebels and two civilians, the Observatory said. It said the assault by regime forces on Al-Heffa, which has recently witnessed an escalation of anti-regime protests, continued into Wednesday, with tanks and helicopters joining the fray. The Observatory said anti-regime fighters seized two security headquarters in the town of Salma, in a region known as Kurdish Mountains, and reported an army defector was killed in the province. In the central province of Hama, a civilian was shot dead while another died in a blast, it said. On Tuesday, 55 people were killed in Syria, including 26 soldiers, 19 civilians and 10 rebels, according to the monitoring group. Although no doubt, the Shabiha are already there. Amnesty said no mercy to Syrian politician after Houla massacre.They will fall.We will see them at Hague court.Evil men never won.UN will bombarded them.They are waiting for Russia and China approval. They will get it after more massacre by Shabiha and Syrian armies. Amnesty said no mercy to Syrian politician after Houla massacre.They will fall.We will see them at Hague court.Evil men never won.UN will bombarded them.They are waiting Russia and China approval. They will get it after more massacre by Shabiha and Syrian armies.